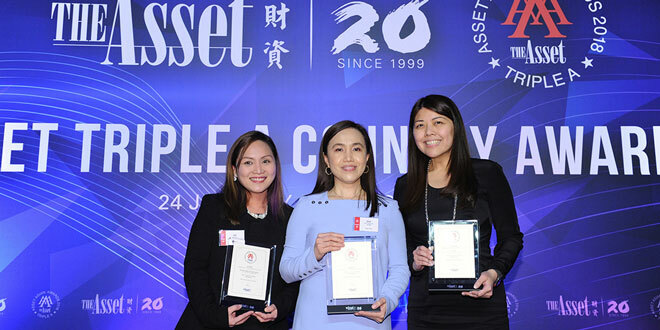 Gigi Miguel (center), International Container Terminal Services, Inc. (ICTSI) Vice President & Treasurer, accepted the award during The Asset Triple A Country Awards 2018 dinner held last 24 January at the Grand Ballroom, Four Seasons Hotel Hong Kong. International Container Terminal Services, Inc. (ICTSI) has won The Asset’s Triple A Country Awards 2018 Best Corporate Bond – Philippines for the company’s USD400 million fixed-for-life perpetual securities issued in January last year. ICTSI is the first ASEAN issuer to offer equity-accounted fixed-for-life senior perpetual securities in the international debt capital market. Rafael Consing Jr., ICTSI senior vice president and chief financial officer, described the deal as “part of the Company’s strategy of prudent and value-accretive capital and risk management. The bond issue was arranged by joint lead managers Citibank, Credit Suisse, and Standard Chartered. The annual Triple A Country Awards represents the industry’s most prestigious awards for banking, finance, treasury and the capital markets. It is organized by The Asset, Asia’s financial publishing group with the widest reach among Asian issuers and global institutional investors in the region.